History: This work was sold for $16.2 million in 2005. Pop Art was a major visual art movement, created as a response to Abstract Expressionism - the dominant art movement of post-World War II. Instead of taking inspirations from classical themes or what so called the "elitist culture", Pop Art draws much of its ideas and techniques from popular mass culture. Roy Lichtenstein was a leading figure of American Pop Art. His paintings were heavily inspired by (or borrowed from) comic books, cartoon images and advertising billboards. Most of Lichtenstein's works were in the style of a comic strip. 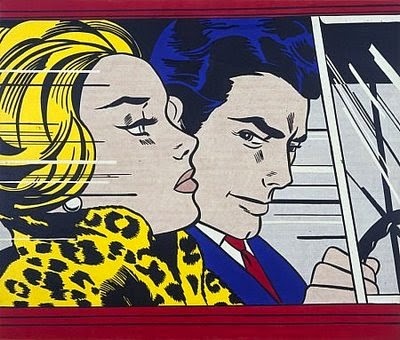 This Lichtenstein's masterpiece takes direct inspiration from a comic book called Girls' Romances. The painting's bold primary colors add dramatic effects and allow it to quickly capture the viewer's attention. A handsome gentleman, who bears resemblance to Bruce Wayne from Batman, is driving his car. He takes a peek at the lovely blonde on his right. Each of the two characters in the painting is given a unique personality -- much of it comes from the distinct facial expression. The gentleman's expression could be interpreted in many different ways -- malicious, guarding, upset. The lady's expression could be interpreted as either indifference or resignation. The whole scene is depicted in motion. This work was a good presentation of contemporary American culture.